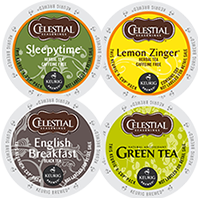 Try a variety of Celestial Seasonings teas for your Keurig brewer! Sleepytime Herbal Tea (4 K-cups). 88 Count $55.80 $53.80 On Special!